This post will help you understand various types of Google AdSense Policy Violations, how to resolve them and a new Page Level Policy Action update that would certainly bring some cheer to the AdSense Publishers. Google stopped serving ads on the whole site that violates AdSense policies. Google will now remove ads only from a particular page that violates Adsense policy guidelines. Having said so, Google will impose Site level actions if needed. And in case of repeated violations, a publisher may face Account level action. Google would soon launch a new AdSense Policy Center for Publishers that would provide more transparency on violations found and actions taken. This would help publishers to act on it with step by step instructions provided in the policy center. Now let's get back to some basics. Google AdSense is a reliable income source for many around the world. While AdSense brings a pleasure of earning substantial amount of money, at times it gives us nightmares with its Policy Violation Actions. We come across questions such as Why is my AdSense account disabled? Why Google stopped serving ads on my site? What are the Google AdSense Policy Guidelines? How to resolve the AdSense violation action? Let us try to find out answers to these questions. "Google monitors the sites that AdSense ads appear on, to ensure that they comply with our programme policies. 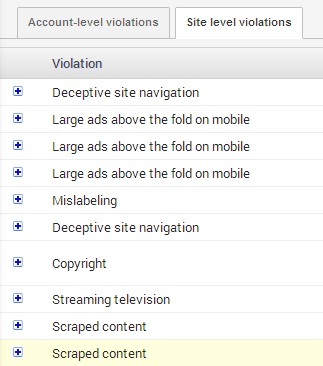 We have identified the following violations on your sites. Please note that this represents only the violations that we have currently identified. You are responsible for ensuring that your properties fully comply with our policies at all times. 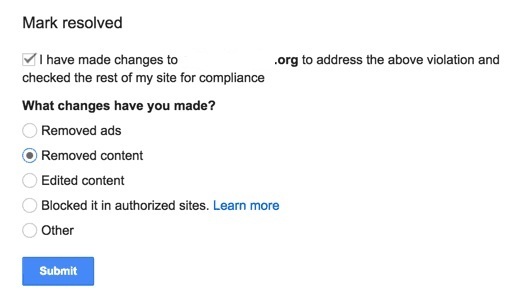 We suggest that you regularly review all your sites for compliance. For more information regarding our policy notifications, visit our Help Centre. " Now in case you violated any of those programme policies, you could receive a Policy Violation message in that section. Depending on the severity of the violation, you can either receive an Account level violation or a Site level violation. The difference is very well explained in the following answer that I obtained from the Adsense Help Center. Publishers may not implement Google ads in a manner that disguises the ads in any way. In order to maintain a good user experience, it is important for publishers to clearly distinguish Google ads from site content. This includes, but is not limited to: site layouts in which the ads push content below the fold on mobile devices; placing 300x250 or larger ad units above the fold on a mobile optimized site. Update - Google now allows placement of 300x250 ad unit above the fold on a mobile site. "After careful review, we've determined that when 300x250 ads are implemented above the fold in a user-friendly way, the ads do not annoy, distract, or result in ad performance issues." As stated in our program policies, we may not show Google ads on pages with little or no value and/or excessive advertising to the user. This includes pages that are scraping or rewriting of content from other sources without adding value. 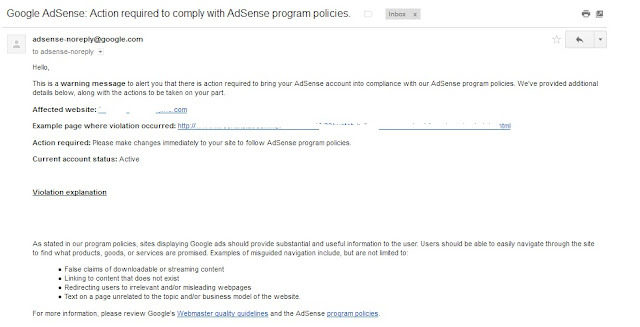 How to resolve an Adsense Policy Violation? Google allows you three days to fix the issue before they may take a strict action and disable the ads permanently. If one of the sites under your Adsense account is affected, remove the ads from that particular site. Now either you can keep the affected site without ads and keep running ads on your other sites, or you can take necessary steps to make the affected site compliant with the Adsense policies. Once you have made necessary modifications to the site, mark the action as resolved in your Adsense account. So for example if you received a warning for Deceptive Site Navigation, probably you have too many broken links on your site that lead user nowhere. Or maybe you are leading users to irrelevant pages. Try to fix such issues within the given time frame (generally three days) and mark the issue as resolved in the account. In case you have received an account level violation or if your account is already disabled, you may have to make necessary changes as per the guidelines and write to AdSense explaining the substantial efforts you took to be compliant with the AdSense policies. How should I avoid AdSense Policy Violation Warning?